Amazonite ~ Personal Truth: “In this image, a mirror of Amazonite stands alone in a vast sky scape. In the mirror is also reflected the image of Amazonite. This is the image of personal truth. That which is on the inside is exhibited on the outside, and is reflected back at you from all that is in your environment. Amazonite exhibits a perfect blue-green ray with striations of white. This stone’s colour and energy link it to the ocean, the place of primal creation. When the first life forms appeared in the ocean, a transformation occurred. Oxygen, the breath of life, was created by these life forms within the cradle of the ocean. It is with oxygen and breath that we express our deepest selves and emotions, while water makes up a large percentage of our bodies. The frequency of Amazonite is a blending of these two compounds. Air is water in its freest form. It is the spirit of water. Water is the body of air. Without one the other could not exist. Amazonite activates our expressive capabilities and encourages us to speak our higher mind. It encourages balance in our expressions through its own balancing of the properties of Air and Water energies. Speaking one’s own inner truth is often difficult. We are taught from an early age to tailor our expressions and emotions to the needs of others. It is time now to take our own emotions and expressions into consideration. We are only upon this Earth for a short time. who will express your truth if you do not? Speech is a powerful tool to use in the creation of your reality. When you express your personal truth, you are creating a reality that is in line with the deepest lessons you have come to experience in this lifetime. It is through the expression of personal truth that you gain the respect of yourself and others. The ability to speak a personal truth is the mark of a spiritual warrior. Call upon the energy of Amazonite to aid you in combining the wisdom of the Air element and the emotion of the Water element. With the aid of this Ally, you will open your heart to higher guidance, and express your personal truth in a way that will serve the highest good of all concerned. 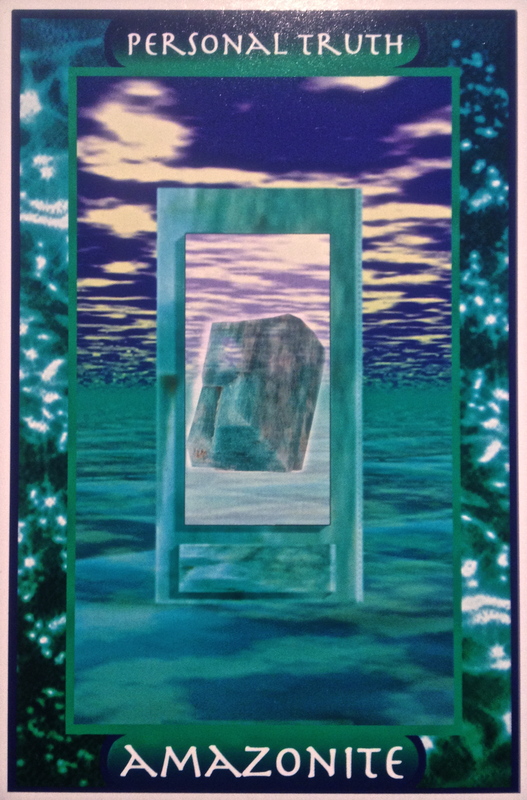 The Message: “When Amazonite appears in your cards, it is reminding you of the importance of expressing your personal truth through your words and actions. If you live your life according to your truth, you will gain a sense of trust in yourself and your own motives. Your path of growth in this world will become clearer when you cease living your life to please others. The current situation will not be resolved or freed to move until you have stated your own truth. Have you been hiding your feelings in order to keep from “rocking the boat”? Or perhaps you are being asked to take a stand before everyone, declaring your personal truth in order to make it a reality. Allow the frequency of Amazonite to resonate deep within your heart and throat Chakras, stimulating the words and actions that are living within you. Call upon the spiritual warrior’s weapon of personal truth, and know that in declaring your mind and heart, your path will be made clear. Many of us, particularly women, have trouble putting our own needs and desires first. Maybe we have been taught that we should put other’s needs before our own, or that we are selfish if we speak up and say what we truly want. Maybe someone has belittled our dreams, not listened to us when we talk. Maybe we feel that we have never been truly seen and heard, or accepted for who we truly are? Has compromise taken over when making decisions? Are you always keeping in mind the reactions of others; to the point, possibly, of denying your own heart’s desire? Now, harnessing the amazing and deep communication powers of Amazonite; it is time to speak your truth. Amazonite will assist you in opening, clearing and expanding the throat chakra, connecting it to the heart center. This allows you to access deep spiritual wisdom and feel confident in speaking right from the Heart. What you have to say does not need to be edited; it should not compromised, and it may not please or impress those who must hear you out. This is a statement of your deepest truth; spoken by your Higher Self, your very Soul. No fear, no self-doubt, no compromise, no holding back. For the Highest Good of all and Your Highest Good. Are you ready? Take some time in meditation and contemplation; get your words organized, whether in your head or on paper so that you are completely clear with yourself before presenting your words to others. It is important that you are not wishy-washy, nervous or doubtful when you speak; your personal truth is coming straight from your heart and Soul. When you authentically speak your truth; there is no wrong…. and there is no turning back. You are a spiritual warrior, armed with your authenticity, your love and your dreams, fearlessly walking your divine path.